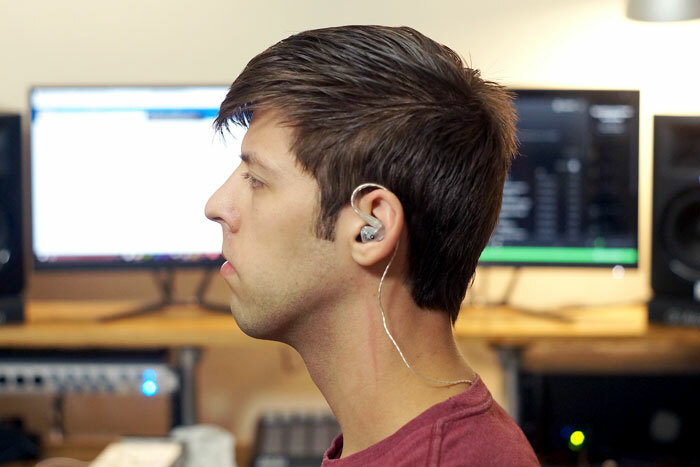 The Audiofly AF100 In-Ear Monitors are Audiofly’s cheapest in-ear monitors and they offer musicians live in-ear monitoring for $90. 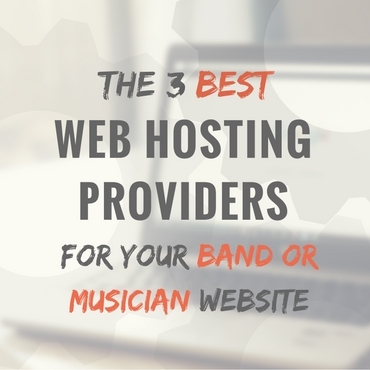 While they’re not the lowest cost option out there for musicians, they are comparable in price to many popular alternatives like the Shure Se215s and Westone UM Pro 10s. Audiofly and the AF100s are relatively new on the market and I wanted to get a closer look at them to see how they sound. 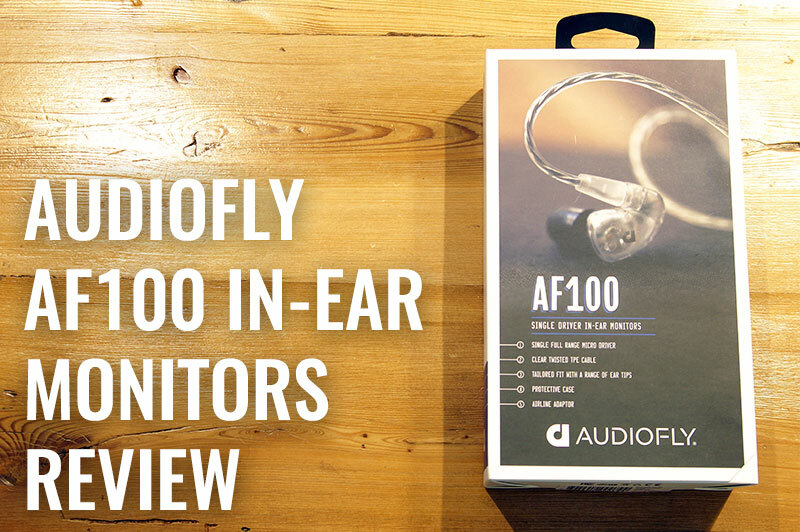 Audiofly was kind enough to send out a pair to test and in this review, I’ll be covering the build quality, features, fit, and overall sound quality of the monitors. With that said, all opinions expressed in this article are my own. 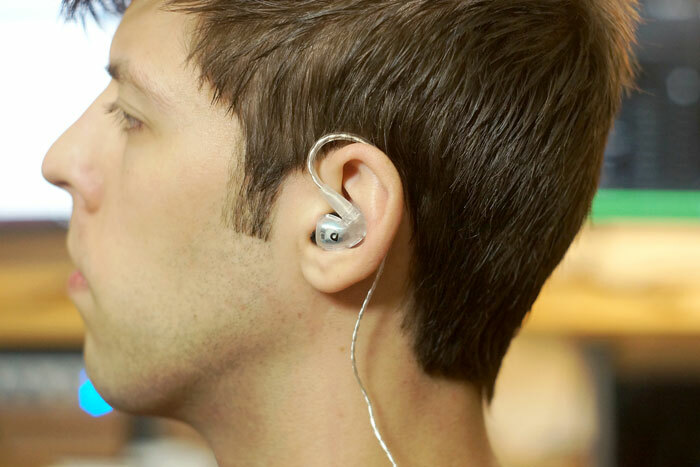 Overall, the build quality of the AF100 in-ear monitors is comparable to many other units in this price range. They feel solid. Nothing in particular sticks out to me in terms of quality. However, there are a few features/build decisions that think could have been better. For one, the actual earbuds do not disconnect from the headphone cable itself. This means should the cable or one of the earbuds break, you’ll need to buy a whole new set at $90 again. While this loop fits comfortably, I prefer the much more common approach of using a bendable cable at the top of the earbud that you can bend around the back of the ear. In my opinion, this allows for a more snug fit. On the plus side, these monitors come with a nice carrying case, a 1/4″ adapter, an airline adapter, a small cleaning brush, 6 pairs of silicone eartips, and one pair of foam ear tips. How Do the AF100s Fit? Like I mentioned, these headphones feature a preformed loop. It can be bent in order to get the headphone to fit around your ear but it will snap back into place once released. Some may appreciate this easy setup. 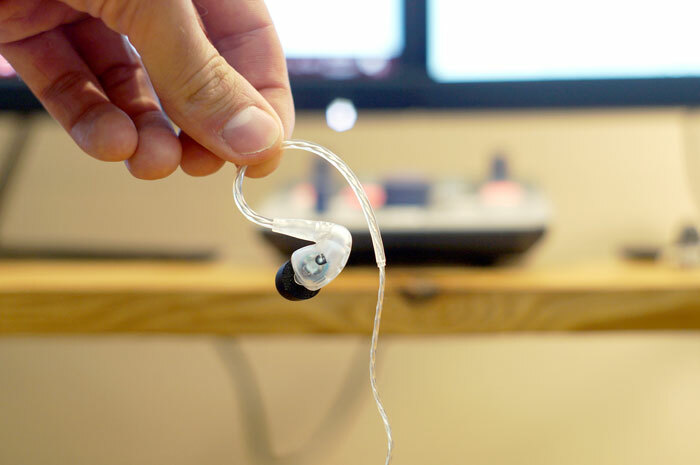 But, I actually prefer in-ears that have a bendable cable just after the earbud. 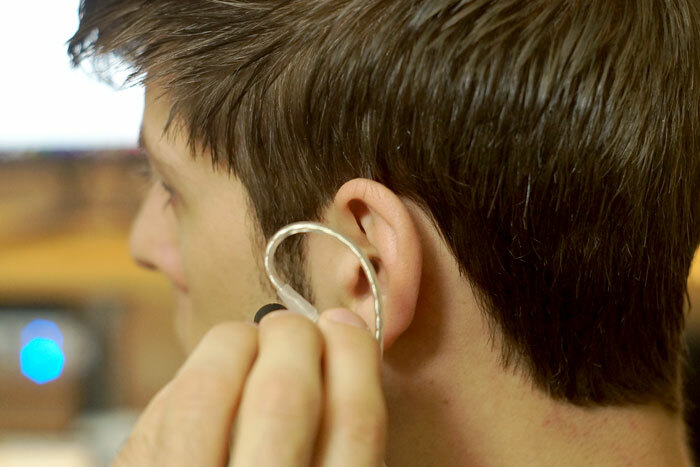 This allows you to wrap the cable around the ear and push it tight to conform to your ear’s shape. I believe this offers a more secure fit. Much like other in-ears I’ve used, I found the foam ear tips to be the best fit for me and they seem to block out the most sound during practice. The largest round silicone tips also fit me well. 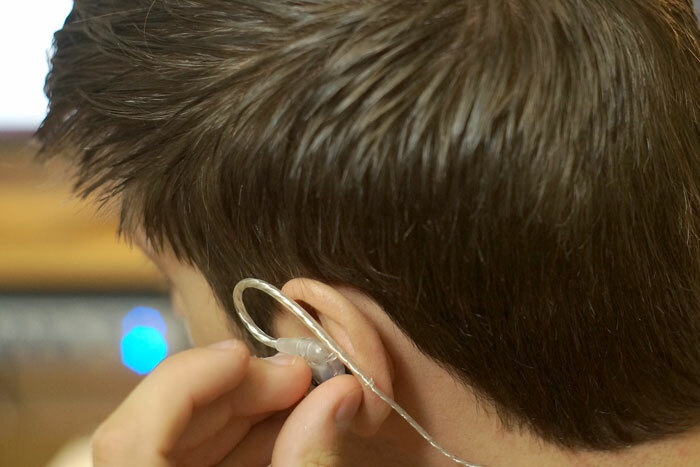 To get the most out of these in-ears, or any in-ear headphones, make sure to experiment with the different eartips to find the best fit for you. Not only will this help to provide the most secure fit but it will also help to block out external noise and protect your hearing. How Do the AF100s Sound & Perform? Now, the question all of you likely want to know: How do the Audiofly AF100s sound? The AF100s offer decent sound quality but are comparable to other units in this price range. I found the AF100s to have a more pronounced lower range offering more bass than other similar in-ears like the MEE Audio M6 Pros. However, while the bass is more present, I felt the mids and highs weren’t as clear and the emphasized lower range made the overall mix a bit muddy. 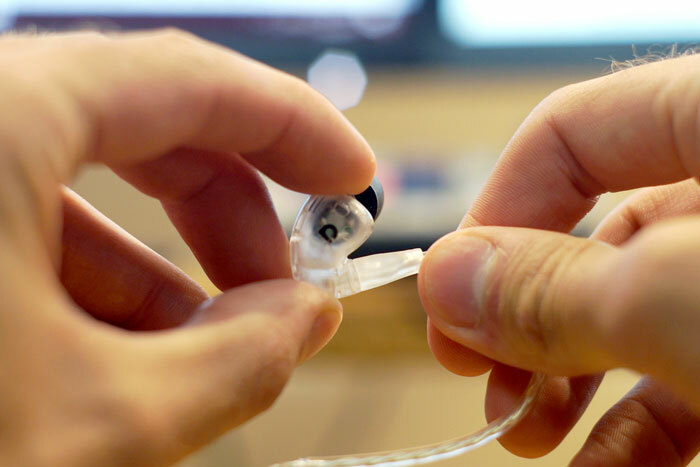 Conclusion: Should You Buy The AF100 In-Ear Monitors? In conclusion, I think the AF100 In-Ear Monitors are right about what you’d expect to pay in this price range. The audio quality is decent but I don’t think it stands out enough over other models. The included accessories like the carrying case, 1/4″ adapter, extra eartips, etc. are nice but fairly standard and offered by most other competitors. As a relative newcomer, I’d like to see maybe some more accessories to add value much like the MEE Audio M6 Pros have with included extra cables. Throw in the fact that the earbuds do not disconnect from the cable itself and it puts these in-ears a little behind the pack. 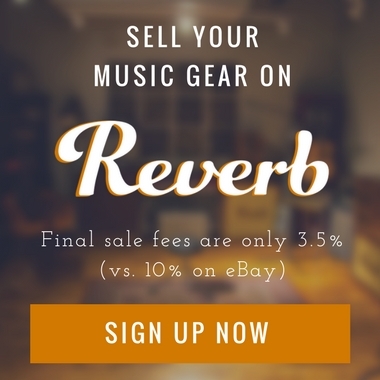 To me, this is really a huge oversight as almost every other company selling in-ears at this price range offers this feature. So keep in mind, if you buy these in-ears and one part of them breaks (the cable, the earbud, etc. 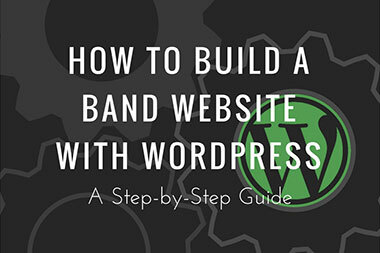 ), you’ll need to replace the whole set. All-in-all, I think it really comes down to a matter of preference. If you like a bit more bass in your mix, then these might be a good fit. If you like a bit more clarity in the mid and highs, you might try something else. I’d recommend trying them before buying if you can. That’s all I have for you in this review. I hope you found it helpful and if you have any questions, leave them in the comments below and I’ll do my best to answer them. Thanks for reading! I have the M6’s now, they are fine playing the guitar but when I am on bass I am always fighting for the right mix. Would these AF100s possibly be a better fit? Or would I be better off with something else. I have read that the second generation M6’s have a better overall sound.